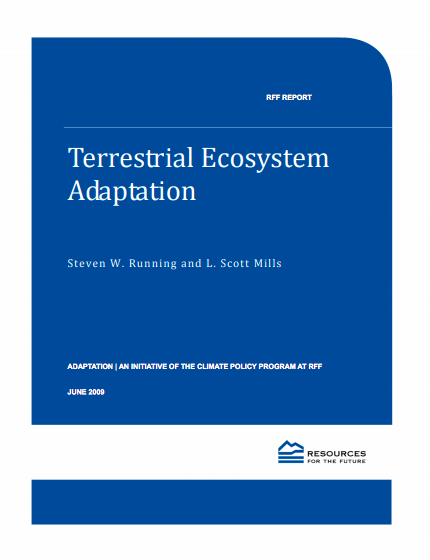 In this report, we evaluate adaptation issues for natural ecosystems. We will specifically focus on the interactions with the abiotic environment of plants and animals, along with other organisms with which they interact (e.g., disease‐causing bacteria and viruses). We further limit ourselves to natural ecosystems in which the predominant vegetation has developed without having been planted, irrigated, or fertilized. Most of the natural lands in the United States are managed by federal or state governments. Agricultural lands—including range grazing lands —are dealt with in a related adaptation report. This will evaluate the potential magnitudes and challenges facing terrestrial ecosystems in the United States in adapting to changing climate over the next 30–50 years. Our report will not address attribution or mitigation of climate change, as these topics have been dealt with in many other forums. We will begin with a brief summary of the current trajectory of the changing climate in the United States, including both temporal and spatial patterns. We will then relate these trends to ecosystem impacts and vulnerabilities. We consider adaptation in the broad sense to include any means by which organisms successfully confront a perturbation such as climate change. This includes both local adaptation in place—either through plastic responses or through evolutionary changes—as well as changes in movements within or outside of the current geographic range. Some species (often invasive and disease species) will adapt spectacularly. By contrast, those unable to adapt will experience decreased average mean fitness, translating into population decline, decreased persistence, and changed community and ecosystem structure. After considering ecological adaptation mechanisms, it becomes possible to consider potential management options to enhance adaptation. We do not make recommendations of specific adaptation activities at this point; rather, we suggest alternatives to begin the discussion.